Much love and gratitude to Linda of Litebeing Chronicles for putting together this challenge that provides the opportunity to reflect on, and embrace gratitude for, everything the year has presented in our lives, celebrates one another and the journeys we individually take that are uniquely inspiring, and seeds the year to come, providing a springboard into uncharted, more expansive waters. After Linda invited me to participate in the Blog Challenge – Present Your Gifts – I chose today, December 22nd, to share my personal reflections in answer to the five questions she asked us to consider. I felt the day after Winter Solstice’s New Moon would align with shedding “more light” on the reflections I would explore. Interestingly, in one of my dreams last night I was swimming in ocean water that was in an underground chamber that had circular tunnels that curved around so you could not see ahead. It seemed that I was able to breathe underwater, mirroring an ability I literally and briefly had once when I was about 10 years old. And as I was comfortably swimming in the water, I saw a smaller black horse with long mane and tail, gracefully swimming underwater ahead of me. It looked to be a miniature version of a full-sized adult horse, perhaps about three feet across. It gave new meaning to “seahorse” and I remember thinking that in the dream experience, wondering about and revering these “seahorses” (there were two) showing up literally as Earth-bound horses swimming/dancing effortlessly in the ocean, breathing underwater. As one black “seahorse” disappeared around the tunnel ahead, the other would emerge from the tunnel behind me – an inner journey of synchronous alignment, divine timing, and trusted synergy. They seemed to swim in and out and stayed just ahead of me, enough to be able to experience their exquisite dance beneath the water’s surface, but just out of reach to keep their mystery and dark beauty elusive and free, as they should be – admired, beloved, honored, respected, integrated in reflection, and recognized for their enchanting inspiration and power, but not meant to be contained, held, owned, or attached to in any way. Their free-spirit and sovereign free will was not in any way to be broken and they embodied that knowingness so naturally and powerfully. 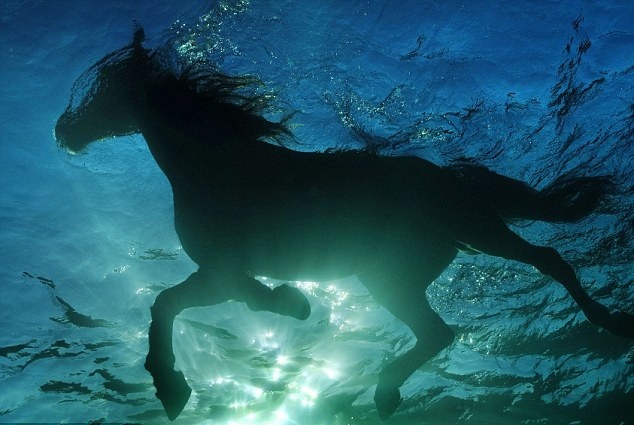 Horses have always been one of the symbolic representations of myself that I have both identified with and literally experienced in my soul “history”, so it was meaningful to have the sacred duality of my shadow selves displayed in this underwater realm and duo that played off of one another, to demonstrate the effortless transmutation into something of and beyond both. It was not very “light” beneath the water, but just light enough to clearly see these black beauties gliding with empowered ease and grace – mirroring the messages in the post I shared yesterday “Peace Within…Peace Without” and more, as well as bringing the increased illumination from the darkest of days into experience. I found this dream to be very empowering and “illuminating”, while also reflectively symbolic of this year for me, which seemed perfect to begin this challenge with sharing and allowing you to take from the dream symbolism what speaks to you. I continue to learn that listening to my intuition – that very subtle, whispering voice of truth – is vital and can bring about greater harmony – I’ve made a promise to make it my best friend. I continue to learn about exercising greater discernment of energies, especially the subtle ones, and through the willingness to explore experiences, both challenging and of ease, I am fine-tuning my natural flow, which increasingly and more efficiently aligns me when I do. I learned that I don’t “need” anything (continuing to simplify and release in my life) except to be true to and honoring of my essence, since this simultaneously honors the greater/highest good, and that everything is simply a choice I can experience in what ever way that I decide to create the journey of my life in each moment. I’m learning how to make that a less challenged journey without judgment. I continue to experience the lesson of all answers being within me if I embrace and face raw honesty with myself. I learned that things I thought I used to want, I really don’t, and that is a huge release and return to peace for me. This has come through continued deep exploration, mirror work, rewiring, pattern and conditioning release, realization of empathic absorption, and willingness to say no to that which does not serve me, hence does not serve others – or rather that I don’t “need” in “that particular way” to serve me, since everything has a purpose. I learned how true it is that I: love my freedom and expansiveness, have the need to explore, will never fit a definition someone may try to categorize me in, thrive on change and constantly will do so in big ways, will never “grow up”, and have absolutely no fear of death or worry over what might happen externally, as I have connected to that eternal peace. I learned, after my trip to Alaska, how ready I am to move on and either live somewhere else, or move around as am called to. I learned that now is truly “my” time and I get to recreate myself every moment in the light of the joy of my heart and am no longer bound to a particular mission or karmic closure I’ve been committed to fulfilling. I’m learning more and more what true unconditionally, detached love and compassion feels like and welcome more expansive realizations, which I have been increasingly having that are tightening the seams more cohesively and consistently to this web of experience. Until so, I engage the challenges to exercise this more. I’m grateful for my dear Russian Tortoise, Gaia, in helping me with this, this year, and for being an example of the authenticity of my own soul that mirrors hers. I continued to learn more about my personal processes that work for me, understanding they aren’t for everyone, and am finally really experiencing the reality of being a “conscious” creator of everything in my life from the tiniest to largest experiences on a grander level. This has me being an observer of experience most of the time. I learned that there is a completion, release, and invitation available to me from this Earth plane spiral when I am satisfied I’ve been here long enough and turn my gaze from Earth to the Stars. I learned the depth of my love for our sacred Terra and why I have been returning so much here (releasing myself from repetitive cycles), but this year I began to integrate my Cosmic essence in a much larger, consciously engaged way and feel this will only increase come 2015, which heralds things I can only imagine, but also don’t need to know right now. It was 2014 that truly drove home and brought thought and action together in terms of not only understanding, but more integratively “being” the new possibilities that open the doorway for collective change. It became very clear how the embodiment of consistent practice and action of my presently experienced authenticity and essence, as well as exercise of bringing concepts into actualization in my own life, and living in my natural frequency no matter what is going on around me, are the most powerful, responsible, and far-reaching ways to serve others. I feel that this has really taken deeper root this year and how I feel I have been of greatest service beyond any of the individual “services”, individual support, or offerings I have provided of my individual gifts, as all of these are extensions of embodying my essence and become more deeply experienced and effective based on this. This in part is why in many ways I have gone more inward, not only to explore greater depths that will assist this process, but also because I am realizing, more and more, the power of just “being” without need to vocalize, although am being even more energetically vocal in the presence of a clearer and more empowered frequency that facilitates by virtue of its innate emanation. In doing so, I have found that you can hold the deliberate and intentional space of who you really are and what you have come to understand as your empowered experience, which then supports and provides others more opportunity to choose, and do, the same for themselves. And they do so not because you tell them to, convince them you know “the way”, try to force or manipulate them, etc., but because the bridge to their divinity has a strong and clear light to support that choice with greatest energetic opportunity that you anchor and mirror for them. It holds the space of wholeness from a place of true unconditional love and compassion that realizes the most responsible and loving thing to do is not to enable others in their temporary experiences of being off-kilter from their own natural frequency. At times that may mean holding your energetic ground, taking a courageous action or an empowered vocalization of YOUR truth -not from a place of telling others what they should feel like and where they should arrive to, but helping them to feel more expanded by virtue of your own expansion. This, I feel, is the most effective and efficient propulsion for change. And when done in the true knowingness of this, there is no attachment to a result of how you may or may not have received a response because you release judgment, embrace responsible love, and continue shining your essence nature. These are countless and come in such a variety of forms from the seeming smallest of things to the largest that I could never list them all, since I see everything as a blessing even when they are things that challenge and trigger me or the people I love. So, rather, I will say that the greatest blessing has been an increased experience of conscious connectedness in a way that mesmerizes and astounds me by its seamless perfection, as well as an increased clarity of essence. And this just gets bigger by the day, moving me to soulful chills constantly. Along with this connectedness has been the bringing together, and alignment, of the most beautiful and dearest soul loves that are most present in my life right now and have infused this year for me with their presence, support, and influence. I can’t tell you how you each are cherished and likely some of you will never, in this lifetime, fully know the extent of my love for you and how special you are. I lost the need to know anything and the ability to psychically know the future, realizing I already do on some level and can just enjoy the journey now. I lost who I was in place of who I am, which brings personal authenticity into my experience to share now. I lost and continue to lose old limiting ideas and definitions that shaped some sense of illusionary security, which could be scary not having any gauge to navigate by or cling to, but I now find exciting and am enjoying the blank slate to courageously create from every moment. I lost my innocence in place of a new-found, undefined purity that is anchoring from my explorations and which I didn’t realize existed, but is even more precious and empowering to me. I lost my need to explain myself, which used to strengthen my voice, but it now brings me greater inner peace, strength, and sense of self to embody that voice. I lost attachment, which used to be a byproduct of conditioned connection, but am now able to love from the expansive, limitless place of my true heart. This year was the biggest yet for channeling clarity, telepathy, and psychic senses. It has also been a big year for transmutational processes happening more naturally and instantly, which makes it hard to explain the process to others since it also is individual I believe. My ability to trust myself has grown. My connection and communication to both Earth and Cosmos increased tenfold. My relationship with animals and crystals grew profoundly in our interactions. And, overall, my energy expanded and deepened, while the theme of personal evolution catapulted beyond what I think I even have consciously grasped. But the biggest gift likely is in coming to know myself and my processes really well so that I no longer suffer, I’m able to easily move in and out of things, I’m never debilitated anymore by pain or challenge, and when collective energies intensify, I never experience the same reality others do. That is huge and I am hugely grateful. Even though all of the dates are filled for December, if you’d like to also join the challenge and share your story, Linda has mentioned being open to extending the challenge into January. Thank you again Linda for igniting this reflection. I hope others will also, if you don’t already daily reflect and find gratitude for your journey, feel prompted to explore these questions for yourself and see where they lead. Posted on December 22, 2014, in Uncategorized and tagged 2014 reflections, human evolution, personal growth. Bookmark the permalink. 15 Comments. Thank you so much Tania for sharing your year with us as part of the blogging challenge. I am grateful for our budding connection and am excited to get to know you more as we all grow and evolve collectively. Here’s too a new cycle filled with tranquility, flow, love without limits, and heart filled adventure. oh linda, thank you so dearly for your beautiful and touching response and again for creating this challenge. it really is a great exercise to sit down and reflect on everything, as well as i think is wonderful to read all the other participants’ experiences for inspiration and connection. interesting you also felt a connection with that particular section, as i completely understand living a more controlled life, and am in awe how much i’ve been able to release that sense of control, as i’ve realized where it stemmed from feeling out of control in other areas or from needing some sense of security and “seeming” power where i still hadn’t found it for myself. that’s not to say i don’t exercise discernment now, but that doesn’t come from a need to control, or balance out something, but from training myself to become ultra conscious of all the little and subtle nuances so i choose more from true empowerment. yes!! here’s to a new cycle for all those beautiful things and more! hehe!! Nice to meet you Tania: This is what really stood out for me, “I learned that now is truly “my” time and I get to recreate myself every moment in the light of the joy of my heart and am no longer bound to a particular mission or karmic closure I’ve been committed to fulfilling.” Thank heavens! Right? Me too! ❤ I decided to follow you. I think your going somewhere 🙂 I mean… that you are already there.